Numerics Calculator is small but very powerful calculating app that will without a doubt increase your productivity, and make your work easier and more fun. 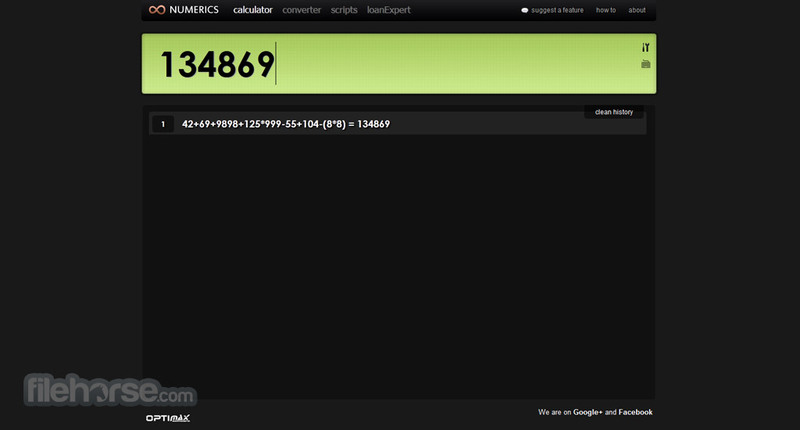 There is no need for installing anything on your computer, the only thing you need is to load Numerics Calculator in your browser page, and you are good to go. Also, all of your previous calculation are saved and nicely presented in history tab, enabling you to keep track on the most important calculations. 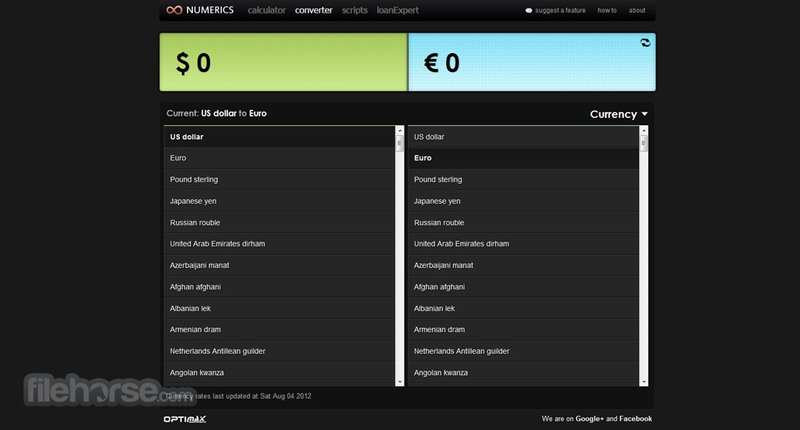 Simple but powerful online calculator and converter! Numerics Calculator is a very useful and versatile calculator webapp that is accessible via any modern browser and is used today by more than 400 thousand people from all around the world, including students, home users, experts, employees and people who work on the move and have access to internet connection. Optimized to work on both home computers and iOS/Android portable devices, this calculator manages to easily show you large interface that will enable you to perform any kind of calculation you like, including math functions (both famous and exoteric), conversion calculator, pre-made support for calculating loans and mortgages, different numeration systems, and more. In addition to those “basic” features, Numerics Calculator also got popular by supporting scripts that enable advanced users to easily create and implement their own custom functions, making this app invaluable for people who want to completely customize their math solving process and enable them to solve almost anything with ease. 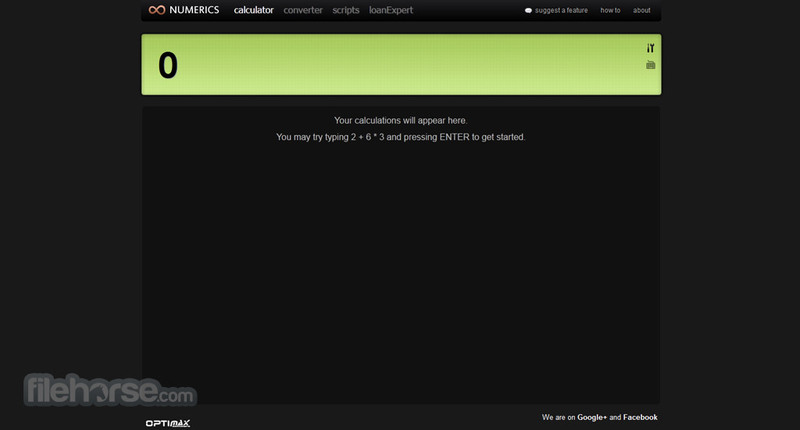 Converter section of Numerics Calculator is located on its own page, with very large interface elements that enable easy use even on devices with smaller screen. Below main working area you can find large lists of supported conversion formats, mostly currencies from all around the world with addition of few precious metals like gold and silver.Scripts tab supports syntax coloring, enabling both novices and seasoned programmers to easily write new scripts that are automatically saved as you type. All in all, Numerics Calculator is a webapp of significant power and easy interface, making it perfect for home uses, students and professionals. For instance, apply one of these famous functions - sin(x), cos(x), sqrt(x), etc. Or even use powerful function shortcuts like a^b, a!, #a, a%b. Convert values with powerful build-in converter.